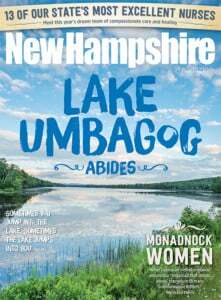 Send letters to Editor Rick Broussard, New Hampshire Magazine, 150 Dow St. Manchester, NH 03101 or e-mail him at editor@nhmagazine.com. As far as I know, nothing I’ve found at yard sales [“Yahd Sales,” April 2015] would make me rich, but I’m happy with the treasures I’ve found. I started frequenting yard sales when I was a single mother and I needed to buy items at deal prices. I would get so excited with some of the great items I would find. Now I have a beautiful home, custom curtains and I can afford to buy what I need at retail prices, yet I still go to yard sales. It’s like looking for a buried treasure, and [it’s a] fabulous feeling you get when you do find it. Below are pictures of a few of my purchases. The first picture is what I believe to be a large vintage swirl bowl with a matching platter. I paid $5 for both pieces. Next is a 10/110 digital reproduction of an original photograph, titled “God’s Feather” by visual essences photographer Joya Pinkham Clark from Wilton, NH. (See owlwoman.com.) Her work is beautiful. This treasure was purchased at a local school’s yard sale. The next item is a watercolor by Carol Kraskar. It looks like it was professionally framed. I have no idea what the picture is worth, but I love it! I also bought a Vincent Van Gogh print of “Starry Night” that also looked professionally framed for $5. There is no going wrong if you buy what you like. I hate to throw cold water on Mr. Pindell’s “biggest wait and see in New Hampshire politics” [“Politics,” April 2015], but in my life it’s not what Maggie Hassan will do. Kelly Ayotte has done an outstanding job for NH and the country vs. our other senator who shows up at election time and then goes into hiding for six years. Senator Ayotte deserves a return to office. Hassan can wait until Senator Shaheen gives it up in 2020. I know that NH Magazine is a friendly, upbeat publication devoted to the best NH has to offer, but after hearing Rep. Warren Groen (Rochester) and Rep. John Burt (Goffstown) belittle and frankly “shock” NH residents with their rude and vicious attack on the fourth grade class that wrote a thoughtful bill to make the red-tailed hawk the state’s official raptor, I would like to see NH Magazine address this in an upcoming issue. Fourth graders in NH learn about their state government. I’d like to think they are proud of their state and its government. I can say today that I am ashamed of the Legislature. I am disheartened that adults could be so rude. I was also furious that many members were not in attendance. I guess they had better things to do …. well, with speakers like Groen and Burt … maybe they did! By keeping silent about such crude behavior, we seem to condone it. Let your articulate writers opine on the fools and thugs we have elected to our governing body. Our children deserve better government, even if we, who voted for these ignorant fools, do not. Editor’s Note: Thanks for asking. Check out our May 2015 Edit Note get our editor’s response. He took it personally as well. I have a question. On page 64 Cuisine [March 2015], potato and leek soup, the directions “to finish, stir in cream and half and half.” How much h and h? There does not seem to be any amount listed. Editor’s Note: One-half cup of half and half OR cream can be used. Sorry for the confusion. Does the magazine have a proofreader? Please refer to page 47 [“Blue Ribbon Beauty,” March 2015], inset re: CH Lakeside Run’s Little Bear. Where is the rest of the article? You have done a terrible disservice to a magnificent dog, Birr, and his wonderful family. At a minimum and as a courtesy, their complete article should be republished, with an apology, in the next issue of NH Magazine. Editor’s Note: The problem was copy overset from a production mistake, not a proofreading error, but we do apologize. We’ve proudly featured Birr in our pages in the past, and the story is correct and complete online. I am the market manager for the state registered Greenland Farmers’ Market and noticed that you’ve got the Rolling Green market listed on your site with our name in its title. It’s an easy mistake, but please note, and make the appropriate correction, that, while they have an indoor winter market, it cannot be called the Greenland Winter Farmers Market per state trade name guidelines. I believe Mr. Simpson now refers to it as the Rolling Green Nursery Winter Farmers Market (without an apostrophe on Farmers). Editor’s Note: Easy mistake, easily corrected. I am the communications coordinator for the City of Concord’s General Services Department and I have been directed to this article: nhmagazine.com/Skate-the-State-Places-to-Ice-Skate-in-New-Hampshire/. It states that the Everett Arena is located in Nashua, but it is actually located in Concord. Would it be possible to please update this information? Even though public skating is done for the season, it’s still good to have the right location of the arena. Editor’s Note: Consider it done. Editor’s Note: Susan Laughlin passed your e-mail along to us. We want to assure you that Buzz just took a one-month hiatus and will be back in the next issue. Due to a variety of factors, we had a space issue and had to put one column aside to accommodate it. Susan does do great work on Cuisine — we’re fans too. Would love to know how many people enter the Spot the Newt contest on average each month. And again, a great magazine, my absolute favorite! Editor’s Note: Michelle, between 40 and 60 newt entries come in each month from the hundreds of readers who play occasionally or every month. No telling how many (like my wife) look and never find a single newt.